Sometimes I go fishing without my rod, just a recon trip to diffrent waters to find out the status on insects and how the hatches are. 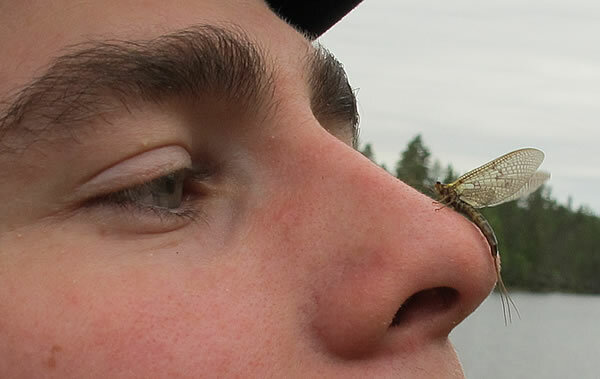 Yesterday I went to a larger lake which have quite nice hatches of mayflies. The hatch normally starts at the end of May and the real fishing begins a week or two later. It was nice to see that the bugs are on schedual, when we arrived we saw a beautyful female Vulgata emerging just outside the bank. That was enough inspiration for me to tie up the fly below. The weather is supposed to be more quite now, less wind and warmer. Maybe this year we will experience good fishing when the flies are hatching too, not just the usual evening chaos when the spinners are falling to lay eggs. I hope so and bet that this fly will do the trick if that happends. Hook: TMC 200R size 10. Tails: Olive or gray ostrich herls, from the smaller plumes. Rib: Brown Spanflex or Stretch Floss. Body: Squirrel SLF, Bleached Ginger or Opossum. Wing: Tan and Camel Aero Dry Wing mixed. Or similar polyyarn. Wingcases: Tan Razor Foam dyed with markerpen. Thorax: Lt. Olive and Olive CDC spun in dubbing loop. Legs: Olive Partridge, 4-5 fibers on each side. Hi there colleagues, pleasant post and fastidious arguments commented here, I am genuinely enjoying by these. I’ve virtually no knowledge of coding but I had been hoping to start my own blog in the near future. Anyway, should you have any ideas or techniques for new blog owners please share. I understand this is off topic however I just needed to ask. Thanks a lot! You can do several straightforward things to get the cheap home insurance UK to meet your needs. to insurance as we would know it at this moment. The Customers are happy to use the facility of internet and phone to make their insurance payments at the selected insurers website. take a slow walk-through each and every room of your property and appraise all things in there and allocate a price to everything to determine the measure of insurance. heavy financial burden to meet the costs of such incidents. Don’t automatically pin the consequence on yourself for which causes the accident if the incident report is actually unclear where each of the blame might are lying. The expensive choice would be to hire a driver as well as the van, that may be the easiest possibility many people would agree, nevertheless, another choice which will be inexpensive and likewise means that you can have completely data of where really your ownership are at all times is to obtain one day car insurance cover. You will have to answer a few questions about your driving record and other pertinent information. 1 day car insurance is ideal for your situation. they are planning to use a car or truck that doesn’t participate in them. If you avail this facility, you become eligible for the following benefits:. trampoline to your home, factor in insurance costs and recommendations in the project. life, health, business and farm insurance. Wow, that�s what I was exploring for, what a data! present here at this weblog, thanks admin of this web site. Thanks for finally talking about >Mayflies in Sight! | Guidelineflyfish’s Blog <Liked it! using for this website? I’m getting tired of WordPress because I’ve had issues with hackers and I’m looking at options for another platform. I would be great if you could point me in the direction of a good platform. It’s important to understand that you have many options when it comes to insuring your vehicle. You should discuss the process of financing auto insurance for 17 year olds with your teen so that he or she knows what to expect with the payment process. Regrettably, the odds of loss in that respect are far higher  seeing as one could be out of pocket with regards to their motor vehicles in a number of ways; be it an accident, the theft of the motor vehicle, stealing of property related to the motor vehicle, and even, chillingly, hijacking. A lot of times it’s challenging to get that “perfect balance” between user friendliness and appearance. I must say you’ve done a awesome job with this. without any insurance cover at all, and the figure will increase daily. we’re raising children, those available balances may one day come in handy. Just make sure that if your car is going up in value as oppossed to down you keep on top of its insured value. to be better off having yourself insured than avoiding it. a car for one day, and pay an extra $20 in insurance that you don’t need. to happen during your driving years, but it does and can happen to the best of us. It also does not pay for pain and suffering, loss of consortium and other injury-related issues. be met at the first meeting.